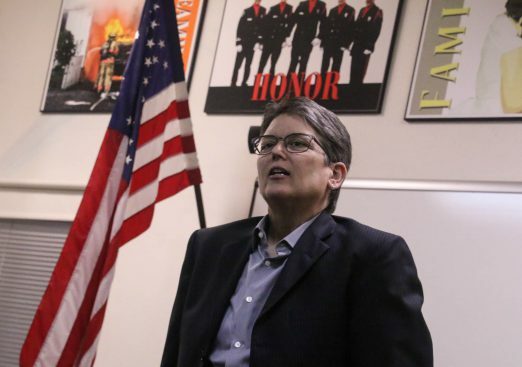 It wasn’t Mitzi Johanknecht‘s first guest appearance before the North Highline Unincorporated Area Council, but last Thursday was her first appearance as King County Sheriff. She said the start of her term has moved fast and been “intense.” It began with training that hadn’t happened in a few years. Eighty “less-lethal shotguns” – “beanbag rounds” – were distributed in the first quarter. And they’ve bought more, “with the goal of having almost everyone who’s in a patrol car … to have that tool on board with them.” She put through a supplemental budget request at mid-year and got funding for a full-time recruiter, which she said the department hasn’t had in years. A few weeks ago, she sent King County Executive Dow Constantine her proposed budget. He asked for millions in cuts; “I said no,” the sheriff declared. “We respect that (he wants us to) cut our budget, but we see some real needs in our communities.” They’ve asked for a Regional Gang Task Force, starting with a sergeant and two detectives from KCSO, “so we can get our arms around the gang problem … (which) extends across all the borders.” In the next week or so, she said, we’ll see the executive’s budget, and she expects to see that included. Another accomplishment: A fulltime community liaison, who will be working fulltime on drafting a community engagement plan. “This is a person who isn’t a badge or gun toter …somebody who actually has experience” in community engagement. The job will be posted soon, she said. They’re also proposing combining some KCSO units to create a Youth and Family Section. And they’ll be working to fight fraud and scams – protecting seniors, for example. Also, they’re asking for a new Training Detective – looking ahead to the potential passage of Initiative 940 (De-escalate Washington) – and Mental Illness and Drug Dependency funds to coordinate someone that will work on services such as crisis intervention. What about marijuana-related money – is it helping? asked NHUAC vice president Barbara Dobkin. The sheriff replied that in order to get some added resources, she suggested putting that money toward helping people with addiction issues, among other things. Will the area get more officers, given the increased density? The sheriff said she asked for 18 more officers – 6 more at each of the unincorporated-area precincts. She also noted that a staffing study is under way. As for those on staff already – NHUAC board members told the sheriff that they get great service from the people currently assigned – Kennamer, Peter Truong, etc. NHUAC president Liz Giba asked about notification when new marijuana businesses are proposed, like recently opened Mr. Buds. Major Howard said they aren’t asked for their opinion at the start, only at renewals. In an ensuing random discussion, the sheriff noted that she has trouble getting to all her e-mail. 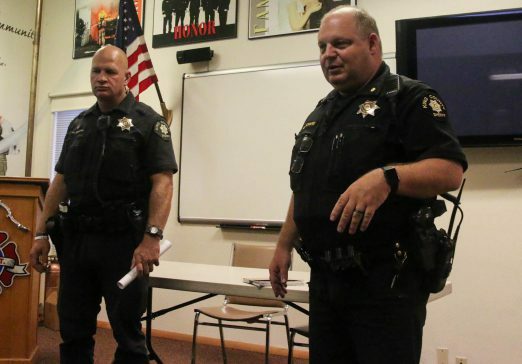 CRIME UPDATE: Storefront Deputy Bill Kennamer (above left) said that KCSO has changed its data-storage methods, so he didn’t have as much data as usual. But they had a lot more “Part 1” crimes than usual. Precinct 4 commander Major Bryan Howard joined Kennamer at the front of the room and explained that every department in the U.S. is converting to a better way to parse data – but comparing new stats with old ones under the old system is apples to oranges. He said crime is going to look higher because “the way we are counting it” has changed. The shift, Howard said, happened back on July 16th. They are writing reports in a new system, too. Everything is compliant with NIBRS (explained here). He does believe auto theft is trending slightly higher. Kennamer said some repeat offenders are back on the street. Major Howard noted that juvenile offenders are now booked only for the most serious things. Howard also talked about the Myers Way encampment zone and said that about six weeks ago, they looked into concerns that campers had spilled into the unincorporated area. Those concerns turned out to be unfounded, he said; a grand total of one person was found camping outside city limits. Giba asked for a status update on the Burien murders. Major Howard said there were no updates that he could discuss. 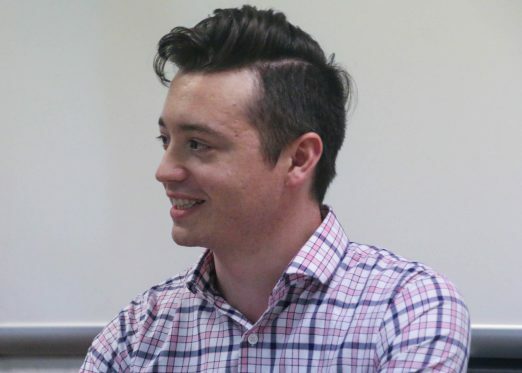 PLANT AMNESTY: Former NHUAC board member Dominic Barrera is now the executive director of this organization founded by the late Cass Turnbull. He also discussed the Seattle tree-ordinance controversy. He said one big concern is the removal of “exceptional trees” from the protections in the new proposal. He also noted that the ordinance has now been placed on a slower track and won’t likely be voted on until early next year. He said one thing advocates will do in the meantime is case studies. NHUAC vice president Barbara Dobkin noted that in this area, “it’s a free for all” and “legacy trees” are being cut down with impunity. Barrera said an attempt to craft a countywide tree ordinance failed years ago. REDEVELOPMENT: In downtown White Center, the former Club Evolucion and former Fantasy Shop are owned by the same investor and both will be split into multiple business spaces, Deputy Kennamer said he had learned. He also noted the work that’s under way on the new Greenbridge development on the east end of the area, off 4th SW. ANNOUNCEMENTS: Upcoming events include the White Center Food Bank gala at the Brockey Center on October 20th and the Southwest Youth and Family Services gala on October 27th. .. The White Center Eagles are having a First Responders Appreciation Dinner, 3-6 pm September 16th, free for any first responder …the White Center Art Walk is coming up, too. UPCOMING MEETINGS: The October meeting will be a candidate forum with 34th District State Senate candidates Shannon Braddock and Joe Nguyen. In November, the King County Land Conservation Initiative is a planned topic, and they’re hoping for a state Liquor and Cannabis Board followup. In December, NHUAC is looking toward a legislative focus with State Reps. Joe Fitzgibbon and Eileen Cody, plus the State Senate seat winner. … NHUAC meets on first Thursdays most months, 7 pm at NHFD HQ (1243 SW 112th).